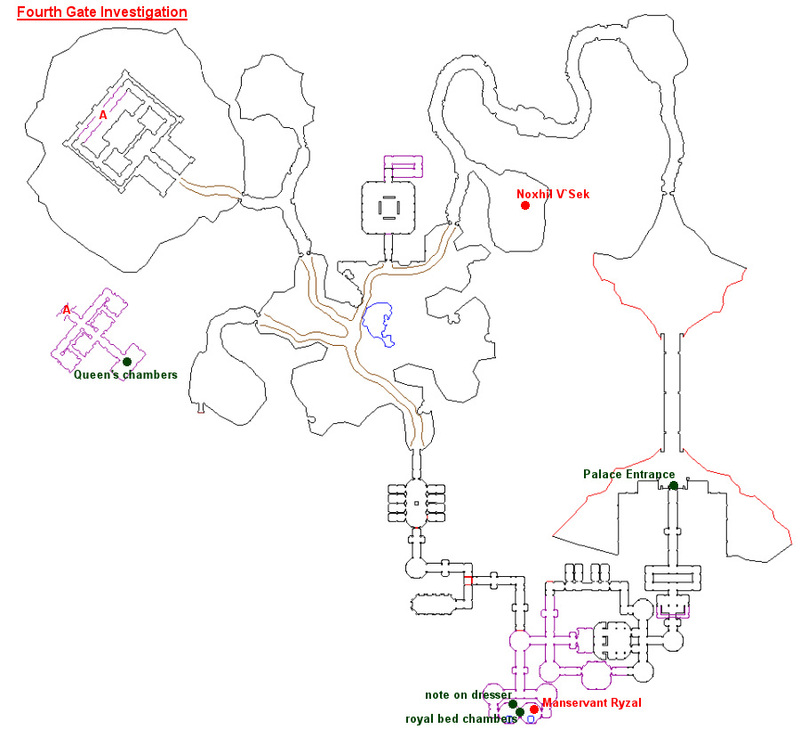 This is a heroic adventure (1-6 players) that begins with Rozz T`Ver (click for map image) in Neriak Fourth Gate. - Say "revenge" to request the task and "begin" to zone in. --- Clear guards away from the paintings, then click on the paintings. --- Clear guards from the statues, then DPS the statues for the update. --- These are the blue banners around the palace; clear guards from them, then click for the update. --- Kill update: "a palace guest"; "a palace courtier; "a visiting noble". --- Kill diseased rats until you've looted 6x "Rancid Rat Meat", then use the meat in the dining area. --- Kill Dragoons in or around the king's bedroom chambers. --- Kill "a royal apothecary" until you've looted 4x "Vial of Effusive Acid", then use the acid in the bedroom's pool. --- Kill "a darklight widow" until you've looted 6x "Spider Egg Sac", then use the sacs in the bed chambers. --- Kill "a fire elemental" until you've looted 1x "Elemental Ember", then use it in the bed chambers. - As soon as the objective for Step #4 is done, the task completes. You have been assigned the task 'Hate Hath No Fury'. 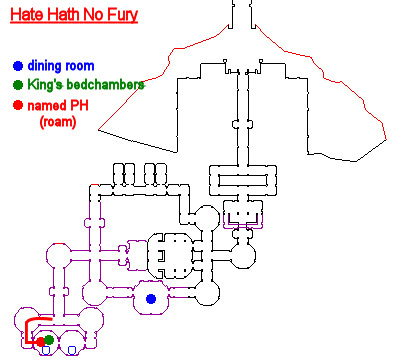 Enter Darklight Palace and cause chaos and destruction, in the name of the queen. Task Window Says: Tear down paintings of the king hung on palace walls, but beware of guards! If You Get This Step: Clear guards away from the paintings, then click on the paintings. Note that guards are mezzable, but immune to stuns, roots, and snares. Task Window Says: Attack statues of the king around the palace to destroy them, but beware of guards! Your actions alert the nearby guards! Task Window Says: Tear down blue warrior banners hung from the palace walls, but beware of guards! If You Get This Step: These are the blue banners around the palace; clear guards from them, then click for the update. Note that guards are mezzable, but immune to stuns, roots, and snares. If you click a banner while guards are still nearby, they aggro you. If You Get This Step: Kill update: "a palace guest"; "a palace courtier; "a visiting noble". Task Window Says: Place rancid rat meat on the table within the dining area and watch as dinner guests dine to their deaths! Rancid meat can be found on diseased rats that roam outside in front of the palace. If You Get This Step: Kill diseased rats until you've looted 6x "Rancid Rat Meat", then use the meat in the dining area. A dinner guest takes a small bite of the rancid meat and begins to convulse before dropping lifelessly to the floor. Task Window Says: Kill all the king's guards that linger near his bedchambers. If You Get This Step: Kill Dragoons in or around the king's bedroom chambers. These mobs hit for a max ~13,000, and are stunnable and mezzable, but not rootable/snareable. Note that a named (Dragoon Torex) has a chance to spawn as a roamer in the middle of all the Dragoon spawns here. This mob is considerably more difficult than trash mobs and does not count towards this step. Task Window Says: An acid bath is just what the king needs! Only royal apothecaries handle such corrosive substances. If You Get This Step: Kill "a royal apothecary" until you've looted 4x "Vial of Effusive Acid", then use the acid in the bedroom's pool to complete the task. These mobs hit for a max ~13,000. If You Get This Step: Kill "a darklight widow" that roam outside in front of the palace. until you've looted 6x "Spider Egg Sac", then use the sacs in the bed chambers to complete the task. If You Get This Step: Kill "a fire elemental" until you've looted 1x "Elemental Ember", then use it in the bed chambers to complete the task. Once that is complete you'll either need to kill dinner guests by poisoning, or kill palace guests. Dinner guests is the easier one so better if you get that, for that one just run back to the entrance, outside you'll find diseased rats. Kill them til you have six tainted meat, invis up, and run to the dining room (you should be skipping at least 3-5 pulls by doing so), once in the dining room just click the rat meat while standing on the table til you've used them all and the dinner guests die, then you get the next two steps. You'll always get the "kill 6 guards" in the bed chamber, and this only applies to Dreadguards inside the chamber and the two stationed right outside, any other guards before the King's bed chamber do not count. If you get the task to place spider egg sacs, that is generally the fastest...just invis back up and run back to the entrance (I made liberal use of my Wizard's evac for instant travel to the entrance), kill spiders until you have 6 sacs, then invis back up and run all the way to the bed chamber, kill the two guards outside, then move inside and clear the room, HA done after you click the spider sacs. The other two are pretty similar, you either need to loot something from a fire elemental or four vials from apothecaries. Both of these mobs will be between the dining room and the bed chamber, with the fire elemental you can get lucky and get the ember from the first one, allowing you to invis up and pass a lot of the last hallways. The apothecaries since you need four, you'll often be clearing most of the way to the king's bedroom, but it's still pretty quick. I generally think this HA is worth adding to your rotation if you're finding the Gribble HAs extremely boring. And with my box group grinding Gribbles I can usually finish my third Gribble and still have 35 minutes to go before I can do the next one, so this helps fill in that gap, and as long as you have all your attunements to use the portals in ETWK you can move between Dead Hills and Neriak 3rd Gate's HAs pretty quickly/easily. It's also generally good to learn this and the to two Neriak HAs (this is probably the only Neriak HA fast enough to justify running regularly, but I do like the other two), because they can appear on Clayton Teek's Heroic Adventure Daily Task, which generally rewards a big chunk of XP and is arguably worth doing every day when leveling. When they introduced Clayton Teek (he took over Guard Haman's duties who was previously in ETWK), they removed the Gribble HAs from the Heroic Task, so if you're only comfortable doing Gribbles you'll never get to benefit from the Heroic daily task, and for as easy as some of the other HAs are (like this one) that's a real shame. When it says the prerequisites it does not mention The Missing Scroll which is claimed to be necessary for all other Neriak 4th Gate quests. This is correct. It does not require it as this is the first one I ever did in this zone. I was leveling monk, druid, and shaman through 103. It wasn't difficult though I probably had to do a lot of gratuitous killing. Cazic-Thule once told me telepathically (in the original Whistling Fists quest where you had to run through that he likes it when I cause lots of pain so no worries there, the only bad part was they were probably very poor experience since experience is based on quest completion in these. 19 AA's earned at 105 for completion. Excellent mission: quick to do, generous XP reward. Highly recommended. The fighting is straightforward, the mobs well separated, pulling is easy and even if you get a step requiring pharming drops, they drop at a generous rate. So far done this 3x and never found all 4 collectibles. The zone isnt' that hard to scout so not sure why I've only found 2, 3 and 3. I'm thinking one of the pre-set collectible spawn points is in a very obscure tough-to-impossible spot to access, particularly since Neriak zones don't permit levitation buffs. the DE's in the first two steps generally hit for max 11,500, they are mezzable and level 100 and some summon ( not all). The apothecary and dragoon on last 2 steps hit for 12,688. lastly, one of the collection items that spawned was on the table in the dining room. my mission had both doors locked and nothing I could do on my own allowed me access. I won mission, I tried shrink and illusion tricks. and I tried shadow stepping. what DID work, was popping a merc while standing next to the door. the merc opened the door for me. once inside I picked it up - but was locked inside now. new trick. go to one side, set yourself puller. move around to the other side( merc wont follow). remove puller designation. merc opens doors to get to you. doh wrong mission posted on dropped from named in "royal access"